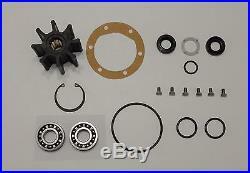 New Sea Water Pump Repair kit with impeller for many Volvo Penta Diesel Engines with the 3-3/8 (86mm) diameter. Volvo 875759 , Impeller 875593 , 877061 , 3841697 , 21951356. Can be used to replace these NLA numbers: 876088 , 876529 , 877373. Fits Volvo pumps: 838314 , 842843 , 858469 , 858470 , 858701 , 860629 Johnson: 10-24061 , 10-24277. 2 ea Seal (316ss garter spring and framework). Fits Volvo Diesel Models listed and others with the 3-3/8 (86mm) diameter. D30 , D31 , D32 , D40 , D41 , D42 , D43 , D44 , AD30A , AQAD30A , TAMD30A , TMD30A , AD31A , AD31B , AD31D , AD31XD , AQAD31A , MD31A , TAMD31A , TAMD31B , TAMD31D , TMD31A , TMD31B , TMD31D , KAD32P-A , AQD40A , MD40A , TMD40A , TMD40B , TMD40C , AD41A , AD41B , AD41D , AQAD41A , D41A , D41B , D41D , TAMD41A , TAMD41B , TAMD41D , TMD41A , TMD41B , TMD41D , KAD42A , KAD42B , KAD42P-A , KAMD42A , KAMD42B , KAMD42P-A , TAMD42B , TAMD42WJ-A , KAD43P-A , KAMD43P-A , KAD44P-A , KAMD44P-A. Note: Some models listed have more than one pump size available. Width: 1.98 (50.2mm). 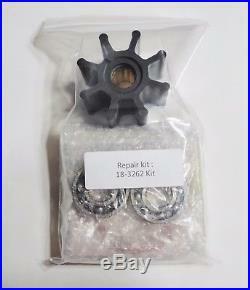 The item "Raw Sea Water Pump Repair Kit Sierra Volvo Penta Marine Diesel Impeller 21951356" is in sale since Wednesday, April 6, 2016. This item is in the category "eBay Motors\Parts & Accessories\Boat Parts\Inboard Engines & Components\Other". The seller is "marineparts_pumps" and is located in Cantonment, Florida.